With the warmer weather here I have been thinking about grilling more and burgers definitely come to mind! When I went over all of my burger recipes I noticed a glaring omission; where were the buffalo chicken burgers? 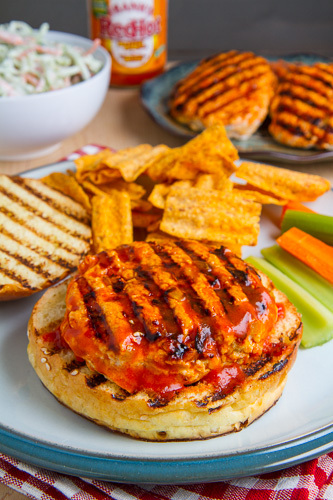 I am a huge fan of all things buffalo chicken and it is always a treat to grill up some buffalo chicken burgers in the summer. 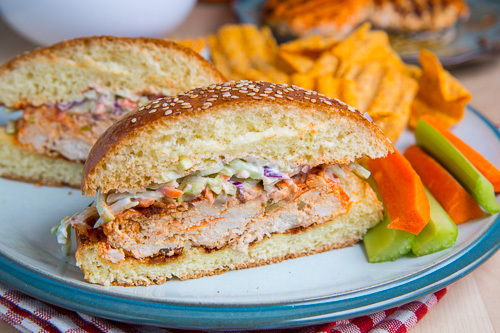 I like to start my buffalo chicken burgers off by grinding some boneless and skinless chicken in the food processor to which I add some buffalo chicken flavours including carrots, celery, onions and blue cheese in addition to the buffalo hot sauce. In general I like to avoid fillers like egg and breadcrumbs in burgers which means that the patties are a little more delicate but as long as you flip them gently they still hold together quite well. Once the patties are assembled all that is left is to grill them until cooked and slightly charred before serving them up in a bun with your favourite condiments. For buffalo chicken burgers I like to keep the condiments simple and my faourite topping is a blue cheese slaw whether it be a cabbage slaw or as in this case a broccoli slaw. 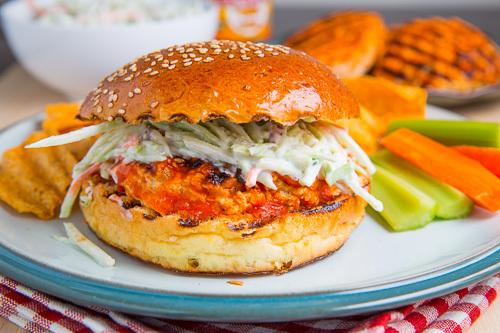 These tasty buffalo chicken burgers are all set to impress at your barbecues this summer! When the burgers are almost done cooking baste them in some more buffalo hot sauce for even more spicy goodness! When you grind your own chicken you know exactly what is in it and just look at that cross section; it almost looks like a solid chicken breast. 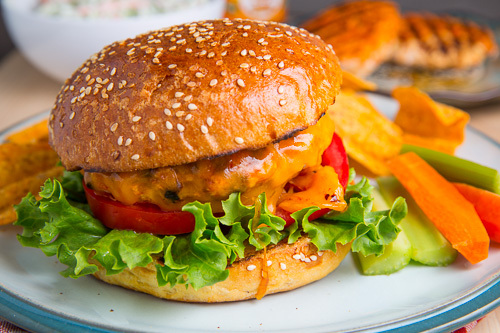 Feel free to dress these buffalo chicken burgers up any way you like and smothering them in melted cheddar cheese and adding bacon are definitely good ways to go! Mix the chicken, carrot, celery, onion, blue cheese, hot sauce, salt and pepper and form into 4 patties. Oil the grill, heat to medium high and cook the patties, about 4-5 minutes per side, basting with more hot sauce near the end and set aside. 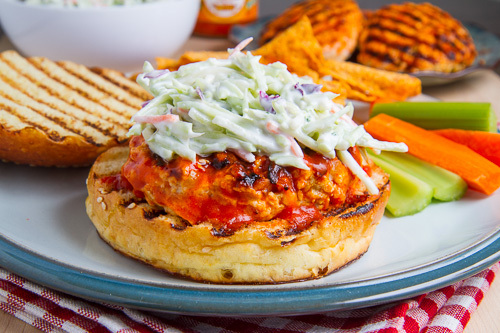 Serve the buffalo chicken burgers in the buns along with the mixture of the slaw and blue cheese dressing. Note: Feel free to add an egg and some breadcrumbs to the burgers. Kevin you know my family is HUGE on buffalo anything so I obviously adore these!! I have to make them this weekend. They look so so good! Another scrumptious looking meal, Kevin! I think I've pinned more sandwiches from you than anyone on my Sandwich Board. 🙂 Now here's another one to pin. That slaw on top just makes me swoon!! Looks amazing Kevin! Love Buffalo Burgers! Yours looks fantastic! These Buffalo burgers look incredible, Kevin! Can't wait to make them this weekend at my cookout! I never thought to make my own ground chicken that way, what a great idea! And mmm… looove buffalo! These will definitely be actioned this weekend!! I sure need these chicken burgers asap! Wow, as usual Kevin that looks absolutely delightful! I DIE. Kevin, you are a genius! LOVE Buffalo Chicken everything! (Posted a yummy-hot Buffalo Chicken Chowder with Cheese Tortellini for the Super Bowl.) I need this recipe in my life…and, really dig how you topped it off with blue cheese slaw! Again, pure genius. Thank you muches! 🙂 xo P.S. Pinning to group boards at Pinterest! My hubby will totally love this! oh Kevin- this is fantastic!! No link to slaw recipe? Sounds delicious! my husband would be OBSESSED with these!! Making them this weekend! Gaby: It is just a really simple slaw with shredded broccoli along with a bit of carrot and red cabbage in the blue cheese dressing that is linked to in the recipe. These were delicious! I used turkey instead of chicken. The burgers were pretty wet when I assembled them so I was worried about how they would hold up on the grill. My husband worked his magic and kept them together! At first I thought I would add some bread crumbs the next time I make these, but they were so delicious and juicy that I don't think I would change a thing. I couldn't make the slaw because my cabbage was questionable, so I topped the burgers with shredded carrots, blue cheese dressing, and Frank's Red Hot. Like I said- delicious! Thanks! Stephanie: Glad you liked them! I prefer the texture and moisture of these burgers without the breadcrumbs but you do need to be a bit more gentle with them when flipping on the grill. I think my friends would love these for our dinner tomorrow–and that buffalo chicken burgers! Most definitely on my radar. Thanks for sharing this awesome recipe, love it! If I only have siriracha hot sauce can it be used instead of the hot sauce you recommened.